The Novena to St. Therese continues. It’s included in this pocket-sized book. Jealousy and envy should be treated in the same way we would treat a rash on our body–as an indication of a problem. The answer to jealousy and envy is to thank God also for the gifts that He has given to others. We need to look upon others not as a threat but as a blessing. Our Lord is the way, the truth and the life. Anything that tempts us toward falseness is not of Him. Again, St. Benedict warns us not even to “entertain” the idea of deceit in our emotions, symbolized by the heart. Unfortunately many people do not believe that the truth is helpful to others. To quote a phrase from the movie A Few Good Men, that was a favorite of students that I once taught Ethics to, “You can’t handle the truth,” seems to be most people’s guiding principle. 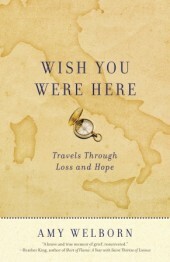 You can read part one of an interview that Amy Welborn did with the Catholic Match website here.It’s about the book Wish You Were Here: Travels through Loss and Hope.. The Random House website for that book is here. The Amazon page for the book is here.